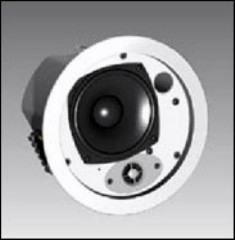 JBL Control 24C Micro Ceiling Speaker DJParts - All Variety of Parts that DJ Needs. • 4½ inch (115 mm) woofer, injection molded graphite cone with butyl rubber surround. • ½ inch (12 mm) polycarbonate tweeter for extended response. Control 24C Micro is 8 ohms and handles 15W. Control 24CT Micro includes 8W multitap transformer for 70V/100V systems. Shallow 4-inch (100 mm) depth. The Control 24C Micro and Control 24CT Micro are compact in-ceiling speakers, providing full, high quality sound for background music and music-plus-paging systems. These speakers are ideally suited for a wide variety of applications, from restaurants and specialty retail stores to professional offices and airports. Low distortion and a smooth, natural frequency response make the Control 24C/CT Micro ideal for medium volume business music systems as well as for the medium to low SPL segments of larger or louder systems. Low frequency output can be augmented with the addition of one of the Control Contractor subwoofer models. Similar mid/high frequency voicing to other JBL Control Contractor loudspeakers can, in many systems, allow for mixing and matching of models within zones without requiring separate equalization. Installation of the Control 24C/CT Micro is quick and easy. The loudspeaker is packaged with the backcan, grille, support backing bracket and tile rails. In addition, optional new construction brackets are available. The entire installation can be accomplished without requiring access above the ceiling. A template is provided for marking the cutout. An innovative C-shaped support backing plate can be installed from below through the cutout to reinforce the top of the ceiling material. Tile bridge rails are included which can be screwed onto the C-plate to extend support to the T-channel grid in suspended ceiling installations. After the speaker is fitted through the cutout, it is held securely in place via mounting tabs which tighten onto the C-plate, if used, or directly onto the ceiling material. The Control 24C/CT Micro backcan is made of formed steel and the speaker is suitable for use in air handling spaces per UL2043. An attachment loop is provided on the backcan for cabling. A seismic tab is provided as a secondary support. The Control 24C/CT Micro trim and baffle are paintable to match any decor. Safety Agency Rating: In accordance with IEC60849 / EN60849. Suitable for use in air handling spaces, per U.L.-2043, U.L.-1480, NFPA90, NFPA70A. MTC-24NC optional new construction bracket, flat MTC-24MR optional mud ring construction bracket 1Half-space (flush mounted in ceiling) 2Continuous Pink Noise rating is IEC-shaped pink noise with a 6 dB crest factor for 100 hours continuously. Continuous program power is a conservative expression of the system’s ability to handle normal speech and music program material and is defined as 3 dB above the Continuous Pink Noise Rating. 3Half-space (in ceiling), averaged 100 Hz to 10 kHz. JBL continually engages in research related to product improvement. The loudspeaker shall be of in-ceiling design, consisting of a 114 mm (4.5 in) low frequency transducer, a 12 mm (0.5 in) tweeter, and frequency dividing network installed in an integral ported enclosure. The low frequency voice coil shall be 24 mm (1 in) in diameter and the cone shall be of lightweight injection molded graphite. Performance specification of a typical production unit shall be as follows: Measured sensitivity (SPL at 1m [3.3 ft] with 2.83V input, averaged from 100 Hz to 10 kHz) shall be at least 86 dB-SPL. Usable frequency response shall extend from 85 Hz to 25 kHz (10 dB below rated sensitivity) with no external equalization. Rated power for 8 ohm unit shall be at least 15 watts continuous pink noise power, defined as conforming to international standard IEC 268-5 (shaped pink noise with peak-to-average ratio of 6 dB) for a period of 100 continuous hours. The speaker shall have a nominal conical polar coverage pattern of 150 degrees (at -6 dB point), averaged 500 Hz to 10 kHz, and shall hold the same consistent polar coverage pattern when averaged in the intelligibility frequency band from 1 kHz to 4 kHz. The backcan shall be constructed of formed steel and the baffle of UL94V-O fire rated medium impact polystyrene. An agency-rated enclosed-terminal wiring block shall be provided on the side of the backcan to allow positive screw-down connection of wiring. The system shall include a support backing plate to reinforce the ceiling material and tile support rails for use on either 2 ft or 600 mm suspended ceiling tiles, and which can be installed from beneath the ceiling tile. Overall front face diameter shall not exceed 195 mm (7.7 in) and overall depth from the bottom of the ceiling shall not exceed 105 mm (4.1 in). Control 24C Micro: Nominal impedance shall be 8 ohms. The loudspeaker shall weight no more than 1.6 kg (3.6 lb). Control 24CT Micro: The loudspeaker shall be equipped with transformer for use in either 70.7V or 100V distributed-line speaker systems, with taps selectable by connecting the input wire to the selected enclosed wiring block terminal. Taps shall be nominally 8W @ 70V, 4W @ 70V (8W @ 100V), 2W @ 70V (4W @ 100V), 1W @ 70V (2W @ 100V) and 0.5W @ 70V (1W @ 100V). The loudspeaker shall weigh no more than 2.0 kg (4.4 lb). The loudspeaker shall be the JBL Model Control 24C Micro (Control 24CT Micro).